We are so thrilled to announce that Spark Central has been awarded a $100,000 grant from Washington Women's Foundation. That means that more West Central families will have access to the creative enrichment programming that leads to brighter futures! We are beyond thrilled to continue to do this work. Spark Central is more than place; we are a community of learners and creative aspirers. By bringing people together for inspiring community events and creative learning, Spark Central invites volunteers, residents, teachers, and students to learn from and inspire one another. Unlike other nonprofits and learning institutions, we strive to teach the actual skills of creativity, innovation, and imagination because they are the secret sauce to thinking differently, forging new paths, and leaving an impact on the world. This free, self-paced coding curriculum is now part of all Spark Central's coding programs. It's a free tool available to anyone who wants to learn coding. Choose a theme, create a profile and get started! Our coding classes will stay the same in many ways — a mix of computer challenges and offline group activities that guide students through a self-paced learning process. Google CS First offers tons of fun themes for coding activities, so each program will offer a different challenge. What's new is that whether you attend Girls Code @ Spark (Grades 4-6), Hour of Code (Grades 4-6) or Drop in & Code (Adults & Kids), you can keep progressing at your own pace and work toward filling up your passport with stickers to earn your t-shirt! Browse our calendar for upcoming program dates. We're so lucky (and grateful). 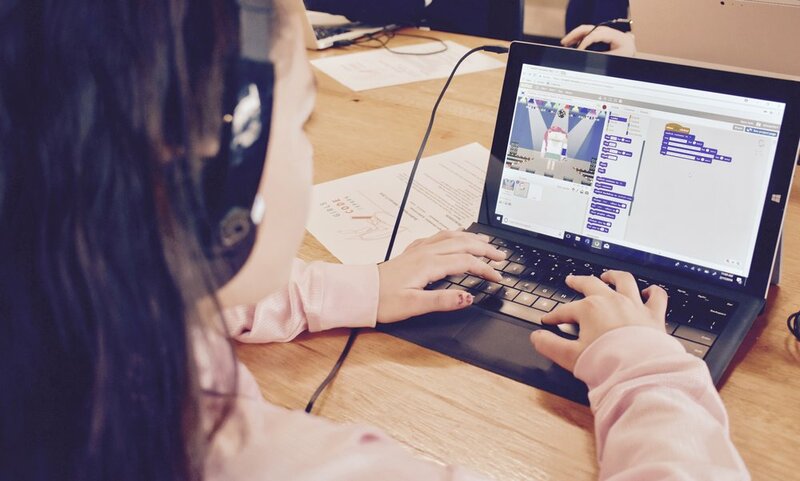 A huge thank you to our instructors, Eugenie Farrow (Girls Code), Diana Hiatt (Girls Code) and Savanna Schrock (Girls Code, Hour of Code & Drop in & Code) for implementing this innovative curriculum at Spark Central! Our deepest gratitude to our technology sponsor, CenturyLink. Do you know what the real rules of four square are? Did you know there's a whole list of variations of the official game — and an entirely different set of variations (on the playground, called "variants") played at Holmes Elementary? This December, you can read all about it in the second issue of West Central Express. Each Thursday afternoon, a creative and enthusiastic group of Holmes student journalists explore questions that matter to them, their school and the West Central community in our six-week after-school newspaper club. Thanks to print sponsorship from the Inlander, grants from Spokane Arts, Smith-Barbieri Progressive Fund, and KREM 2/TEGNA, as well as support from a special group of individual donors, you'll be able to pick up a print copy of their paper, West Central Express, at locations throughout West Central starting in mid-December. Our editor-in-chief, Shawn Vestal of the Spokesman-Review, kicked off the program by leading the students in a brainstorm of what issues they're curious about researching for their stories. Here are just a few: Should kids be allowed to vote? What's going on with all the stray cats in the neighborhood? Does anyone know what the principal likes to do when she's not at school? What are some strategies for kids to improve their grades? What should the next school spirit day theme be? To guide them in their process, the kids get a visit from a different Inlander journalist each week — and tips on how to approach different kinds of stories. Last week, journalist Chey Scott visited and helped the students formulate questions for writing about games. They got to put those questions to work just a few minutes later when each group received a robotics or building toy to review. Each student journalist will leave the West Central Express Newspaper Club with a host of new skills — conducting an interview, writing a story, photojournalism and editing their own work. Even more importantly, they'll leave with greater confidence that their voice matters and they can make a difference in their community using their creative power. We exist to remove barriers creative opportunities like West Central Express for people of all ages. To support us, please donate to our Giving Tuesday campaign! Breaking News: Drop in & Code Now Open to Adults! At Spark Central, we're asked nearly every day if we have resources for adults to learn code. Well, now we do!We've hosted Drop in & Code for kids at Spark Central for more than a year — and now it's officially open to adults as well. The Down-Low on igniting the creativity, innovation, and imagination necessary for people to forge the path to their best future.